Calendar Math is a great time to review and to preview our curriculum. 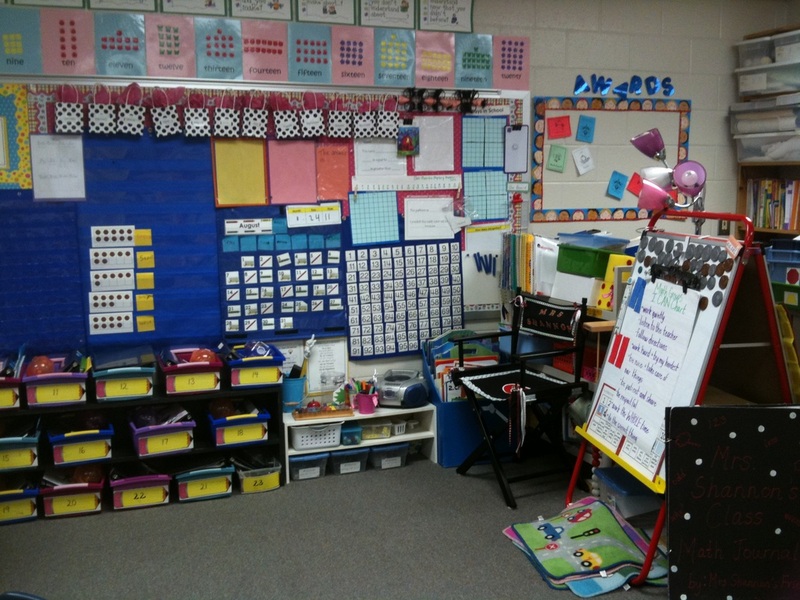 It is also a time to introduce new games or centers and to model and practice exemplars. During calendar, the students are constantly talking about math. They sit next to a math buddy and talk about their math thinking. I constantly ask why or how they got an answer. This helps leads to comprehension. 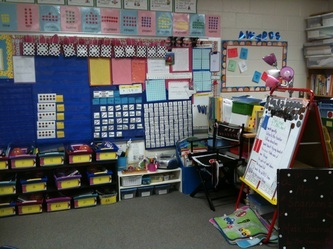 The following ideas are just some of the things we do during calendar time in our classroom. Remember, the possibilities are endless! Most importantly, remember to make calendar work for you and for your students! The beginning of every month we build our calendar together. It is very important to build the entire calendar, not move one piece over one at a time. 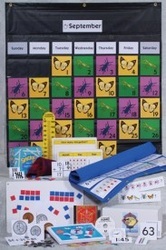 This way, the kids can see how a real calendar looks and how we use it. I start by asking the students what month they think it is and why. Then, we find the correct month and place it in the pocket chart. Then, we add the days of the week. I ask different questions and they have to figure out what day goes where. I even let them write the days of the week on a post-it and place it in the pocket chart. Next, we add our numbers. I ask tons of questions as we build the calendar together. The kids come up and find where the numbers go. At the end, our calendar is up, and the students are so proud because they did it! Here are some sample questions I ask the students as we build the calendar together. After each student puts his or her number up, I always ask how did you know? 1. Find the number ___ . 2. If I add ___ and ___ together, what is my sum? 4. What is ___ more than ___? 5. What is ___ less than ___? 6. Mystery number: Give clues and they have to guess what number you have. 6. This number has ___tens and ___ ones. What number am I? 7. What is the difference between ___ and ____? 8. What number comes after ___? before ___? I get the calendar pieces from the Gwinnett County Public Schools Math Online Communication Center. 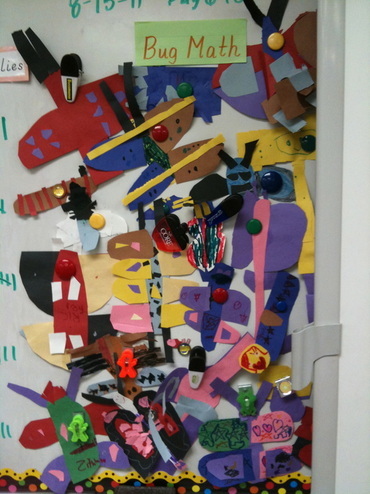 There are tons of patterns within the pieces that the kids notice and we discuss throughout the month. 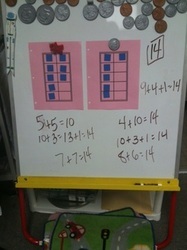 We also do number talks from the book Number Talks by Sherry Parrish. Number talks are a great way for students to use mental math to solve different problems. They are encouraged to think, discuss, and share the strategies they used to solve the problems. For more information, click here for Math Perspectives. I flash dot plates, from John Van de Walle's Teaching Student-Centered Mathematics. 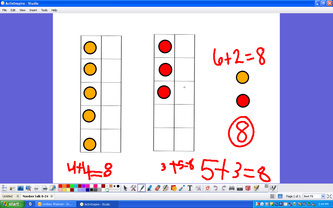 The students subitize the dots and explain how they subitized or how they saw the dots. 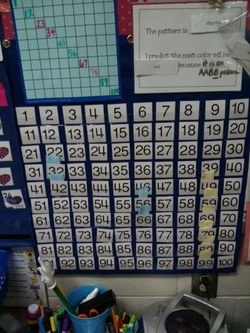 You can do tons with a hundreds chart. 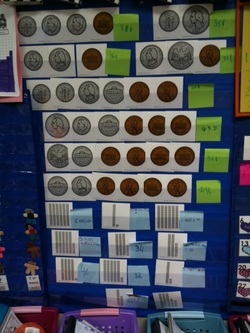 Here is a list of some of things we do with our hundreds pocket chart. This is a place where we look at different cards and record our answers on post-its. I get the pre-made cards from the Math Learning Center. They are part of the Number Corner first grade set. 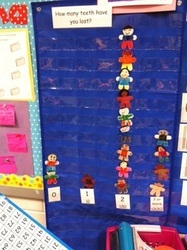 We have a graphing pocket chart. I ask the students different questions, and we graph our data by moving their little person to their choice. Then, we analyze the graph together and record our data on the easel, chart paper, or the sheet protector paper hanging on the calendar. 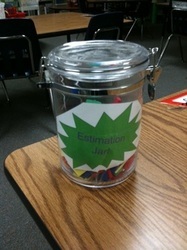 We have an estimation jar. I put different objects in our jar. The kids talk to each other and guess about how many objects are in the jar. We keep a recording sheet of our estimations. This helps the students make connections for the other times we estimate. We also estimate the number of bubbles we are going to blow. Then we build a human number line with our estimations. 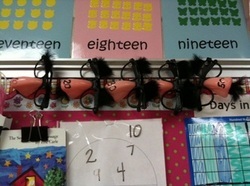 We use funny disguises to help us line up on the number line. The kids love the estimating bubbles activity! I tell the students shape riddles and they need to use their geobands and geoboards to create the shape. We play a lot of the games that are in the Number Corner grade 1 kit during calendar time. The games integrate so many different math skills. Calendar math is the time where I model exemplars and expectations in math journals. We solve different problems on chart paper. 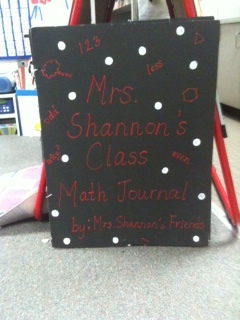 I place these papers into our big class math journal. The students use the class math journal as an anchor chart at the math journal guided math station. We make bugs at the beginning of the school year. We use our bugs throughout the year during calendar and during math time. During calendar, we dance around the room to the song Grasshopper Hop and discuss the different math we see on our bugs. This is a great way to review and preview vocabulary and a great way to make math connections and communicate our mathematical ideas. We create a number line together. The students ask me questions about my mystery number to help them to try and guess my number. 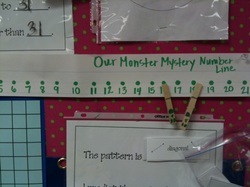 As they get closer, the monsters (clothespins) eat the numbers is not my mystery number. 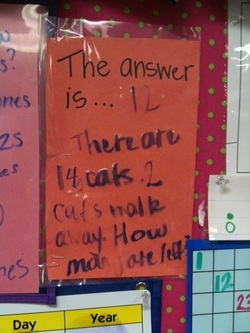 As the year goes on, I let students come up, create the mystery number and answer the questions that are being asked. We also do analogies together. The students talk with each other to try and solve the analogies. We examine the different pages. The students have to discuss and explain which boxes do not belong. It is a great way to show how differently we see math. We create a number by rolling cubes. Then, the students talk with each other to create a story problem. We write one of the story problems on our sheet projector.